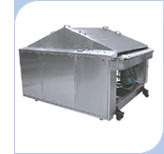 Biscuit production line for crackers and other varieties which have oil on the top surface requires additional equipment called Oil Spray Unit .Oil gets deposited on the baked product by oil spray unit .These Oil spray units are installed after the delivery end of the oven . This kind of Crackers have gained popularity as consumers are now asking for crackers which are baked over crackers which are fried. These Oil spray are used for cracker biscuit s ,hence if planning for cracker variety need to have this Oil spray unit . It can be of portable in nature or wheels are provided on the platform on which this oil spray rest . Baked biscuit which passes the Oil spray unit on stripper conveyor .Excess oil is collected and returned to the reservoir tank.General body is made up stainless steel . Major problem occurs during winter seasons in case of intermittent production of Crackers the oil freezes and chokes pu tube s and these have to be heated to melt the solid fat in these tubes . Most popular Oil spray manufacturer is Arcall. is there any other mechanism involved in post baking oil spraying units?? ?